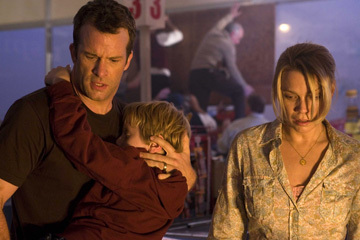 I read Stephen King's The Mist concurrent with its adaptation playing in theaters. I was hoping to go right from one to the next, but the movie's cinematic stay was brief, delaying me until last month's DVD release. I am not normally a fan of Stephen King, but I was eager to see film based on its similarities to one of my favorite video game franchises, Silent Hill. 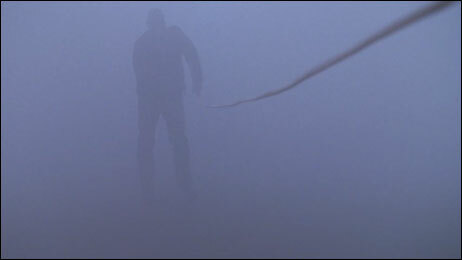 I hoped The Mist would meet the expectations that the mediocre film adaptation of Silent Hill left unfulfilled. Both properties are about normal people who suddenly find their world encroached upon by another — a dark, murky dimension filled with unspeakable horrors. Indeed, the same siren terrifingly heralds hell's transition, and the scene in which a Mist monster first broaches the survivors' safe harbor almost perfectly parallels a similar introduction in the first Silent Hill game. retired from the force to teach in Maine, bringing The Mist with her. But director Frank Darabont commented that "The story is less about the monsters outside than about the monsters inside, the people you're stuck with, your friends and neighbors breaking under the strain." The internal politics of the townspeople stranded in a grocery store enveloped in mist are certainly the film's focus. 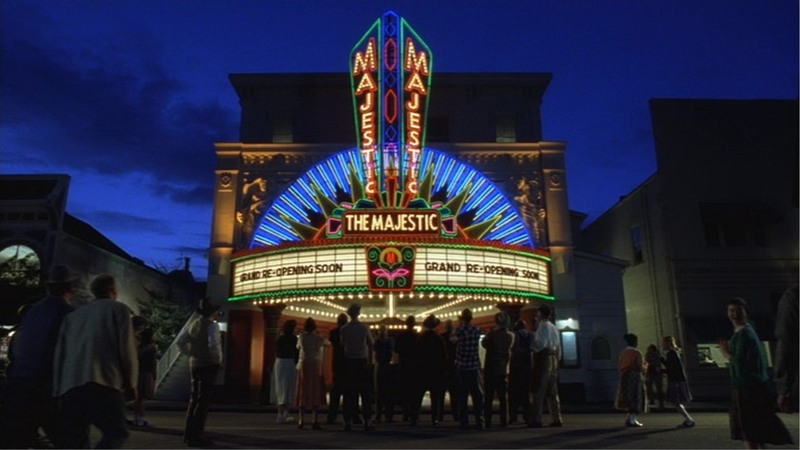 The characters in the movie are more distinct than their literary counterparts, with unique personalities and backgrounds. It's easy to understand the different reactions each has to the crisis: fear, anger, disbelief, action. It makes me wonder: how would I respond to such a threat? One brave, stupid man walks into the mist. Guess how much of him walks out. A store clerk posits that it was to impose order on such chaos that religion and politics were invented. Mrs. Carmody manifests that power when she founds her own cult within the store, quickly gaining disciples seeking salvation. A friend of mine interpreted this portrayal as an anti-religion subtext, but I didn't see it. Though Carmody's cult is extreme and violent, we the audience are given no reason to question the effectiveness of her methods in these desperate times. Does she offer salvation by coincidence, or, were the situation to persist, would we see her religion prove true? The answer seems clearer in the book, whereas the movie leaves the audience with more questions. There were two more concrete elements from the book that didn't make the cut: one, Mr. Drayton and Mrs. Dumfries deal with their desperation in a rather intimate way; and two, the different experiences of the grocery store inhabitants and those of the pharmacy are explained. 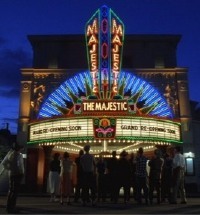 Given that the original Mist was a novella (halfway between a novel and a short story), the level of detail that was preserved in translating the story to film is admirable compared to similar efforts involving longer texts, so I assume these two aspects were cut by directorial mandate and not the confines of the medium. Neither thread was critical to the overall plot, but both would've offered something substantial to the film's development. 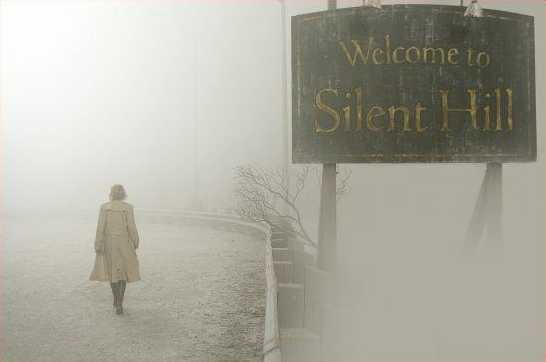 The Silent Hill game and movie came out in 1999 and 2006, respectively. The Mist bookends them with a novella and film in 1980 and 2007. By contrast, two other aspects were introduced. Neither the nature of the mist nor the role of the military were confirmed in the book, left to the speculation of both the characters and the audience; but in the movie, they're more substantiated. There is also a completely new ending, which I suspected would be the case, as the book's final chapter was too open-ended to offer the typical moviegoer the closure he expects. I found the film's conclusion predictable yet disturbing — and consistent with how King treats his protagonists. The Mist was a good film with some nice character moments, clever nuances, and unsettling effects. Having already read The Mist made for an odd experience of seeing the movie for the first time and yet knowing what's going to happen. Some scenes that were intended to be scary I instead found myself laughing at, though I admit it may've been a nervous laughter. Though the source material is always better, I'm unsure that means it should come first. By watching a movie first, I've ruined half of the more detailed book, whereas a book ruins all of a movie. A novella like The Mist may not follow those rules, but I know there will never be a perfect way to experience the same story a second time, even in a new medium.